A must for all your grafting needs. 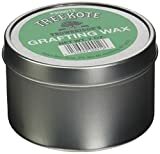 It is the oldest and most used grafting wax in the country. Grafting is often done between January and April. Used in gluing and sealing the wounds of newly grafted trees or shrubs to protect them from infection.